The model separates into eight parts for in-depth examinations. 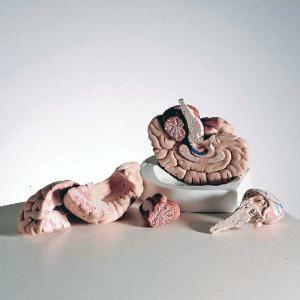 Life-sized and detailed, this model of the human brain is sagittally sectioned; both halves can be separated into frontal with parietal lobes, temporal with occipital lobes, one half of the brain stem, and one half of the cerebellum. The eight-piece model rests in a plastic base and can be removed for closer examination.